The Revenant (2015) – WHO IS THE MAN FROM KRYPTON? I went into this film knowing that it was going to be very good, but in all honesty I had doubts whether it was going to be as good as critics had said, mainly because of Alejandro G. Iñárritu’s previous film was ‘Birdman’ which I thought was very good but nowhere near as amazing as a lot of people thought and it especially irked me that he used special effects and camera trickery to make it seem that the film was shot in one continuous take especially because of all the hard work that other directors put into long takes. Just look at anything Alfonso Cuaron has touched, in each and every long take you can feel the painstaking process that went into those shots. Nevertheless, I was still excited to watch the film as the premise intrigued me and the cast all seemed like they were going to be great. Now, this is where I am so thankful that I didn’t look at any advertising for this film, no set photos, not even any posters, I went in completely blind besides knowing the brief synopsis and the fact that the film was getting awards buzz, which often means very little. I was absolutely blown away by this film from the word go, it gripped me and zipped me through 150 minutes of incredible cinema. Not once did I dare take my eyes off the screen because I couldn’t bare to miss a single second of what I was witnessing. 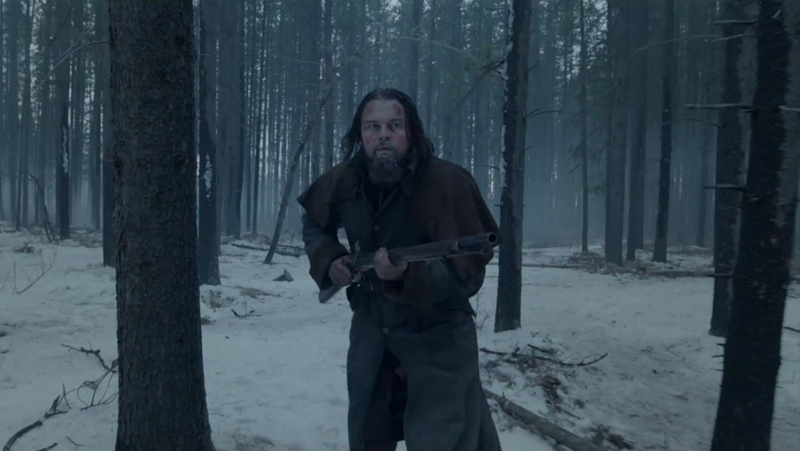 The acting is phenomenal, Leonardo DiCaprio gives the best performance of his career and is so raw and convincing that for the most part, he dissolved into his role as the abandoned Hugh Glass. Tom Hardy just constantly continues to impress me, this could be a year that he gets nominated for both Best Actor and Best Supporting Actor at the Oscars, he definitely won’t win Best Actor for ‘Legend’ simply because of Leo’s powerhouse performance but I could see him easily snagging Supporting Actor. Well, I could if it wasn’t for the equally fantastic Domhnall Gleeson, who despite getting less screen time than Leo and Hardy, still absolutely destroyed his role and defied all expectations I had for him. The film is filled with sparse periods with little to no dialogue and I was so gripped that most of the time I didn’t realise that we had gone, 10, 15 or even 20 minutes without a single word uttered. That speaks not only to the power of this story but of the beauty of this film, every single shot in this film is absolutely gorgeous, all naturally lit (Which was Iñárritu’s gimmick this time) and it just felt so raw and very apt for this story. The few times that there was dialogue was absolutely superb, every single word, every syllable was perfectly crafted, clever and yet not once did it feel out of place or unnatural for these Americans from the 1820’s to be saying. Every word was as important as the next and dialogue was never used as filler or background noise, every word was significant and no matter who said it, was uttered in a perfect cadence. Iñárritu’s camera work has improved enormously since his last film ‘Birdman’, this film is filled with genuine long takes, which are breathtaking, whether the focus is the actions of a character or of the landscape or the weather, it all flowed wonderfully and paced perfectly. The long runtime might seem daunting to some, but the film charged on at breakneck speed yet not once did it feel rushed nor did I ever feel like the film was skipping over anything. The film felt complete, whole and most importantly, satisfying. The score is brilliant if a little understated, at times I was so devoured by the film that the score seemed to be hidden to me, but in some scenes the score was clearly more prevalent and I suspect on repeat viewings, I will notice the score more and appreciate that it helped immerse me into this film so well that I forgot that it was there. I do have one issue with the film though, the Native Americans were filmed speaking one language, but have obviously been dubbed over by actors speaking a different language and it is painfully obvious as the lips aren’t synced at all, I would be curious as to why Iñárritu did this as he seems to be such a perfectionist, who knows, it could have been a creative choice, but it bothered me more than it should have, perhaps because of how flawless this film actually is, to see something like that really rips you out of the moment. It boggles my mind how amazing this film is, I simply did not expect to see a film this good, certainly not this year, and probably not in a long time. I will have to watch it a few times to get a true feel of where I would place it on my list of favourite films of all time, but rest assured, it’s definitely up there. This is one of the very few films that I can wholeheartedly give a perfect score of 10.